The sweetness of California Walnuts complements the tanginess of goat’s cheese so perfectly that I felt compelled to marry the two together in my favourite afternoon tea time treat! Remember that these will only taste as strong as the goat’s cheese that you use – I recommend the logs of French goats cheese, which are ever so slightly stronger than the creamier versions. Chopped roughly, these little nuggets of cheese are deliciously set against the crunch of California Walnuts. 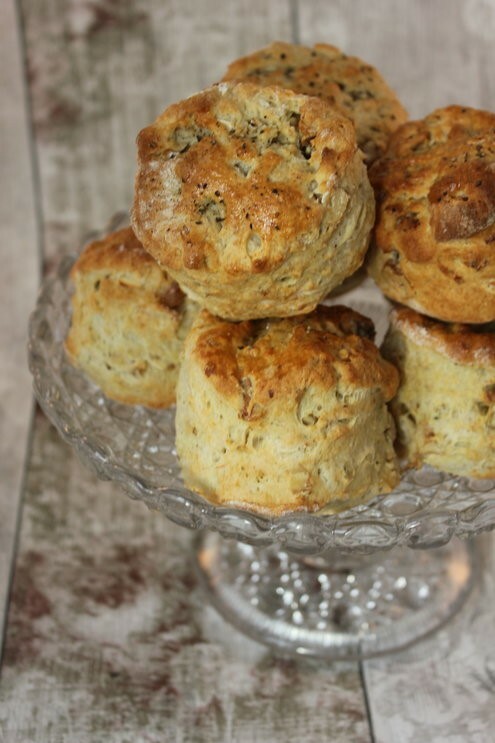 Serve these warm from the oven with butter or any left over goat’s cheese and maybe a little chutney in the place of cream and jam! Sift the flour, raising agents, mustard powder and salt into a large mixing bowl. Give a good seasoning of freshly milled black pepper. Rub the butter into the dry ingredients until you can see no more lumps of butter and the mixture looks even and sandy. Stir the roughly chopped goat’s cheese and California Walnuts into the bowl and create a well in the middle of the ingredients. Pour buttermilk into the well that you have just made. Use a spatula to mix the dry ingredients into the buttermilk, breaking up the lumps of goat’s cheese to distribute evenly, until a dough starts to form. You may need to add more buttermilk if the dough is looking too dry. Once you have a lump of dough, tip out onto a worksurface and knead gently for a moment until it can be rolled out 1 inch thick. Remember to flour your worksurface before rolling out to prevent the dough from sticking. Cut 12 scones from your dough with a 7cm cookie cutter and place spread evenly apart on a baking sheet lined with greaseproof paper. 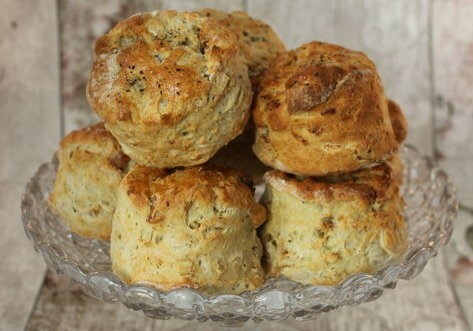 Brush the top of each scone with beaten egg – grind a little extra black pepper on top of this if you like – and bake in a pre-heated oven for 10-12 minutes until risen and golden.